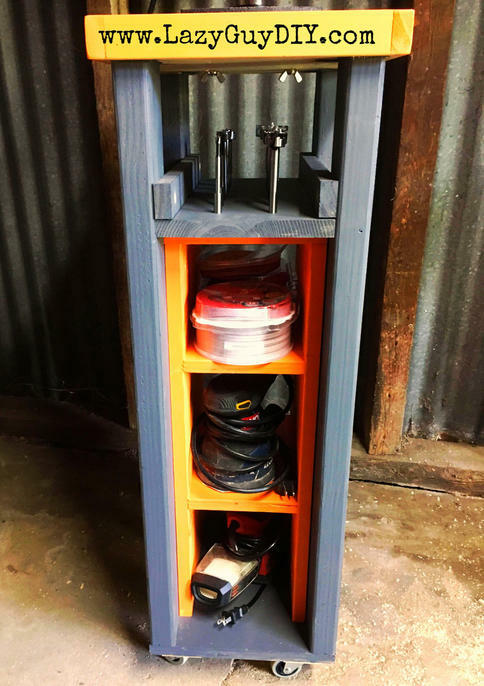 Rolling Drill Press Cart: With Bonus Storage! Ok. Let’s start with the obvious here. Yes the paint job matches my drill press. 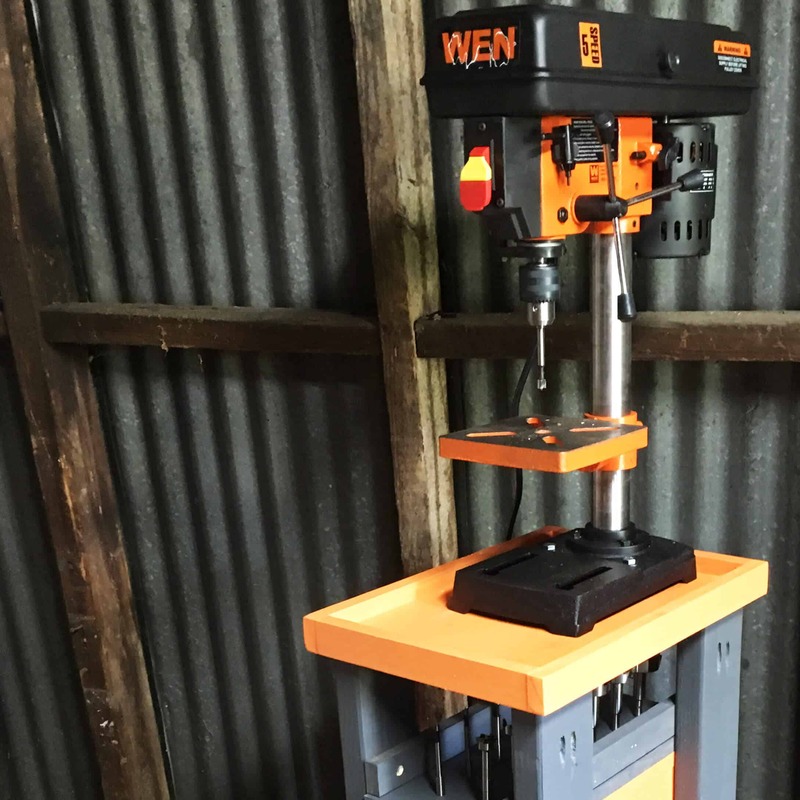 No I did not buy the paint to intentionally match my Wen Drill Press… I bought it to match other tools. I know… I’m as embarrassed as you are. But dang it looks good. 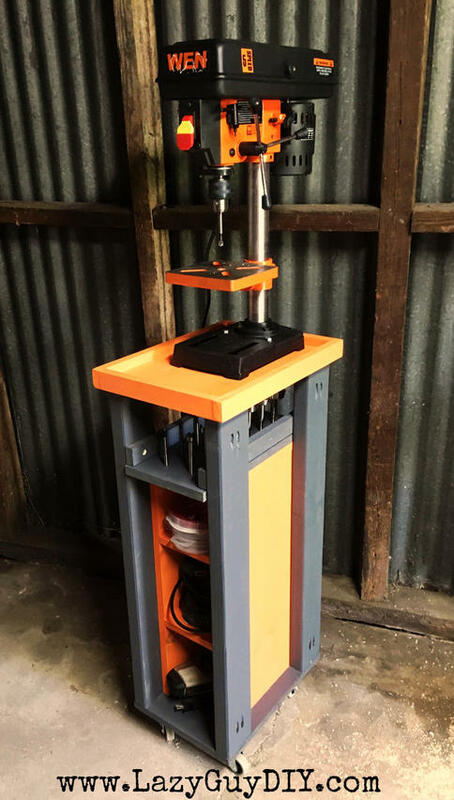 Also, it’s worth mentioning that (once again) my wonderful wife bought me this drill press for Christmas. Unfortunately, it’s been collecting dust for the last few months. It was time to do something about it. 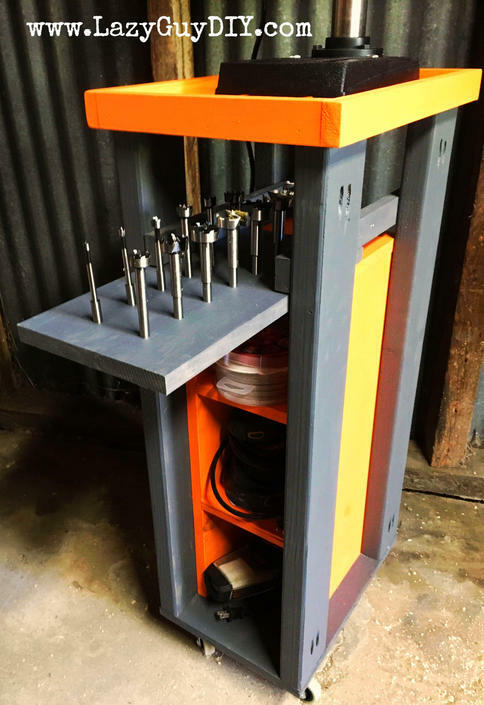 So knowing I am short on space and full of ideas (not full of something else…usually), I decided to combine a rolling drill press cart with storage for my sanders and my forstner bits. So using only scrap wood, my Kreg Jig and 4 casters, I decided it was time this thing had a home. We are all about the base here, but not the Meghan Trainor “bass”. 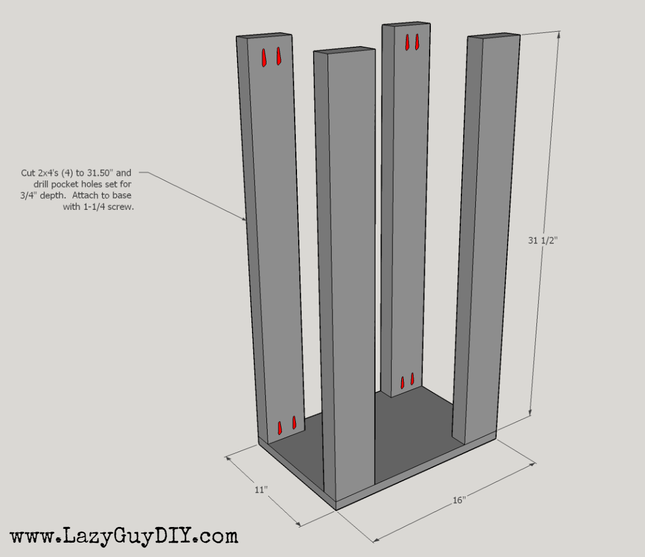 Cut all four 2×4’s to length at 31.50″. Pre-drill pocket holes for 3/4″ depth into the ends of all four. Cut 3/4″ plywood to length at 11″ x 16″. Attach 2×4″s to base using 1 1/4″ pocket screws. This isn’t spring break. Put your top on. Please. Gravity has really changed things. 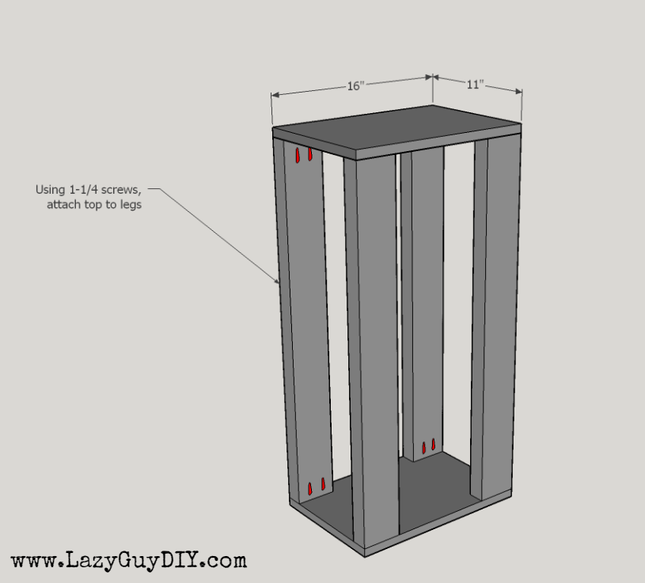 Attach your 11″x16″ plywood to the base using 1-1/4″ pocket screws. You can also attach your casters to what side you deem is the bottom at this point. Step 3 – Make a Tray! 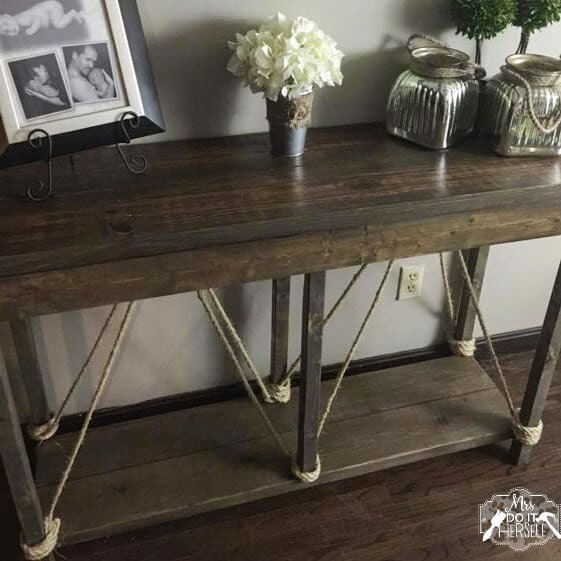 Using your 17.5″ and 11″ pieces of 1×2″ frame around the top shelf using wood glue and brad nails to create a tray. No funny joke this time. Trays are serious things. 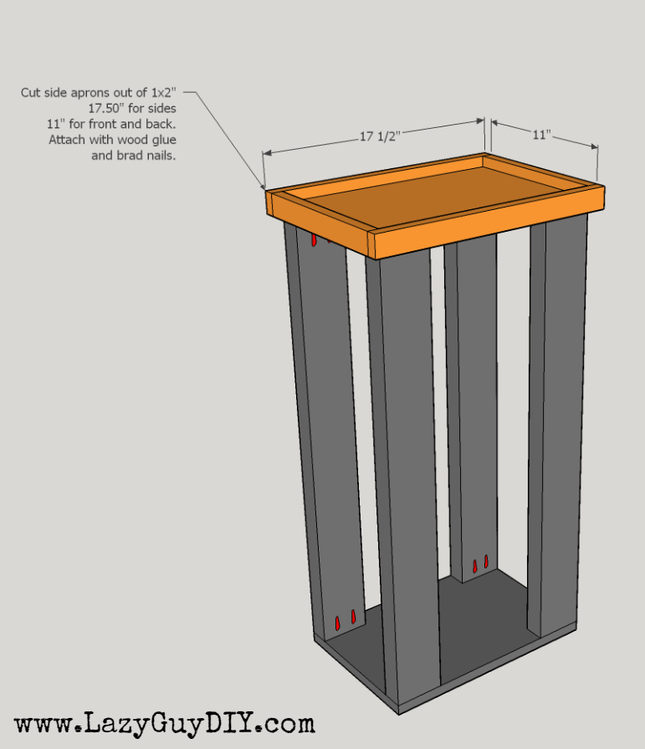 Step 4 – Forget About the Base, Build the Shelves! 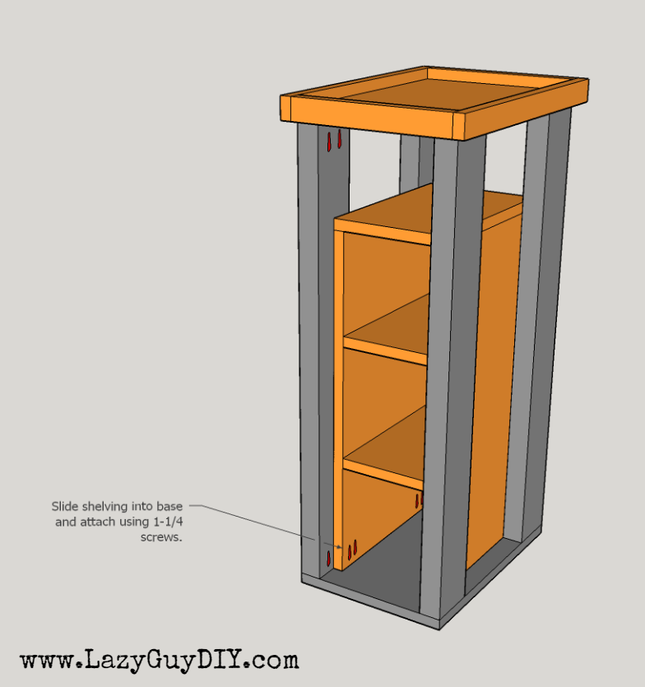 Stating the obvious here… this graphic is showing the shelving unit upside down so you can see the pocket holes. 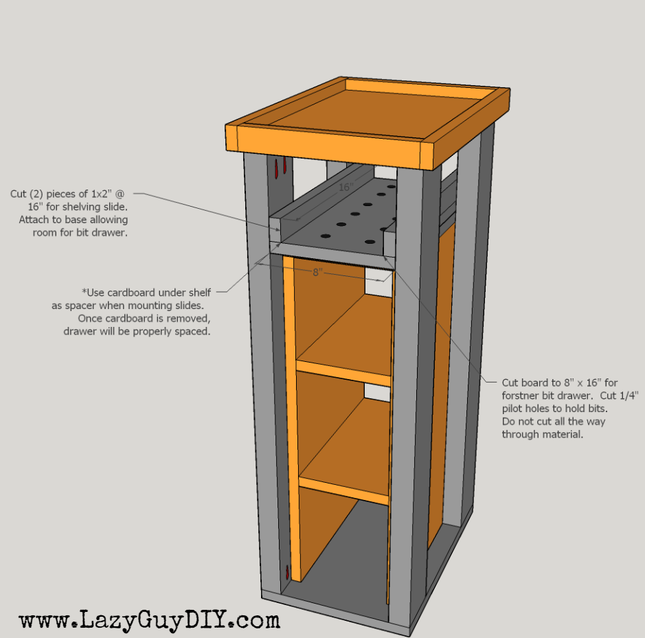 Cut the side pieces (2) to 24.50″ x 12.50″ and the shelves to (2) 12.50″ x 6.50″. Cut the top shelf to 12.50″ x 8″. 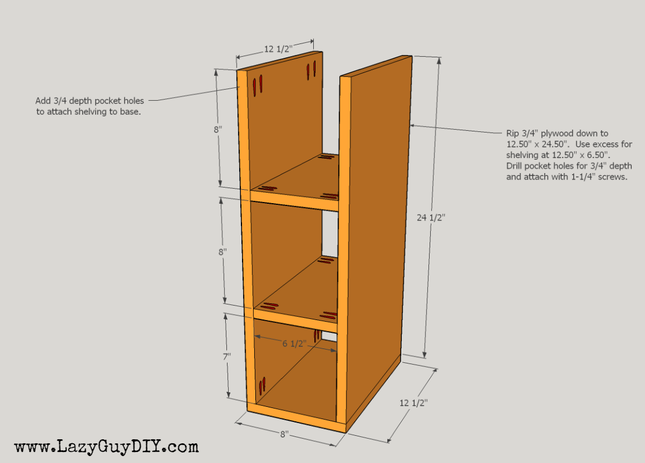 Before assembling, add 3/4″ depth pocket holes to attach the shelving to the base. Assemble shelves allowing for 8″ of spacing between the bottom two shelves. Slide your shelving unit into the base (but be sure to ask permission first). Attach to the base using 1-1/4″ pocket screws. Cut plywood to length 8″x 16″ for Forstner bit storage. 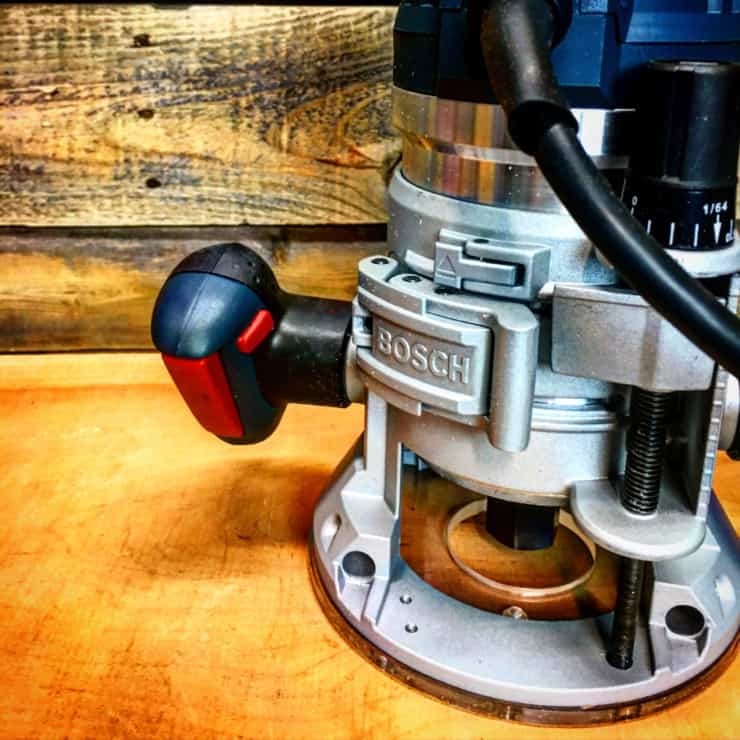 Using your soon to be attached drill press, cut 1/4″ pilot holes into board for Forstner bit storage. 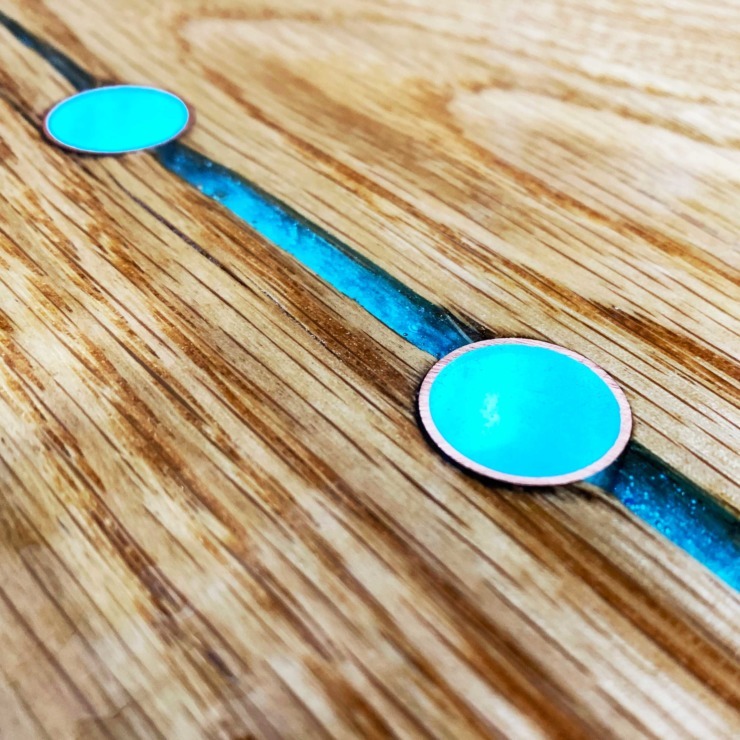 Do not cut holes all the way through board or the bits will slide through and cause issues with your drawer sliding. Cut 1×2″ (2) to 16″. Using a spacer (like cardboard) place under Forstner bit shelf and then attach 1×2″ shelving slides. When the spacer is removed, the Forstner drawer will easily slide out. And you’re done! This was actually a super easy build. I finished with random paint I had sitting around and then mounted the drill press using 2.5″ 3/8’s machine screws and a wing nut. My sanders happily fit in their new cubbies along with a new home for my big stack of sanding disks. I considered making individual shelves for different grits… but I’m Lazy. My forstner bits easily slide out thanks to the spacer trick when attaching the shelving slides. I might add a drawer pull to make this even prettier, but so far it’s hard to get anymore awesome than my orange and gunmetal collaboration. If you have any questions or want me to share your version of the build feel free to Contact Me through email.